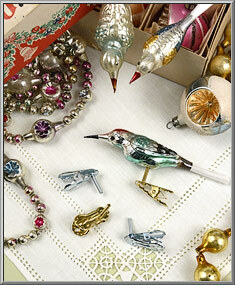 vintage decorations, or to give your own creations a polished look. 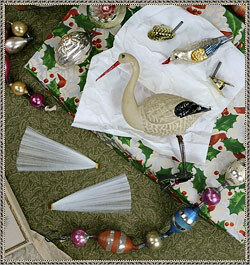 Do you have any blown glass bird ornaments that have misplaced their legs? 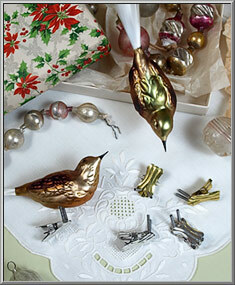 Now with our replacement bird leg clips, any clip-on bird ornament can happily perch on the boughs of your Christmas tree once again! 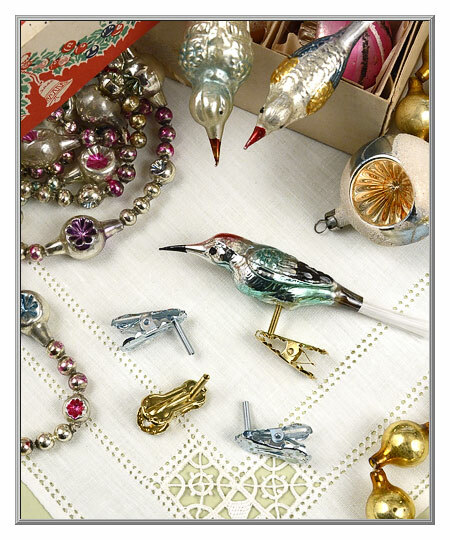 Manufactured in Germany especially for the blown glass Christmas ornament industry, we import these impossible-to-find metal clips for collectors, crafters, artisans and decorators. Suitable for repairing many different types of antique blown glass ornaments, we offer the clips with one or two legs of spiralled wire. 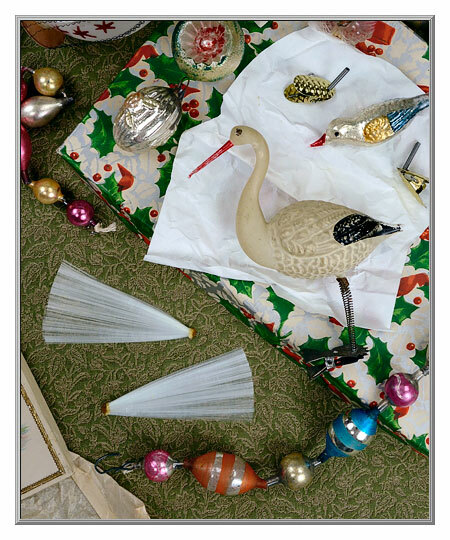 These clips are also wonderful when crafting your own holiday ornaments because they will add a polished, professional look to your custom creations. in need of spun glass tails or wings? 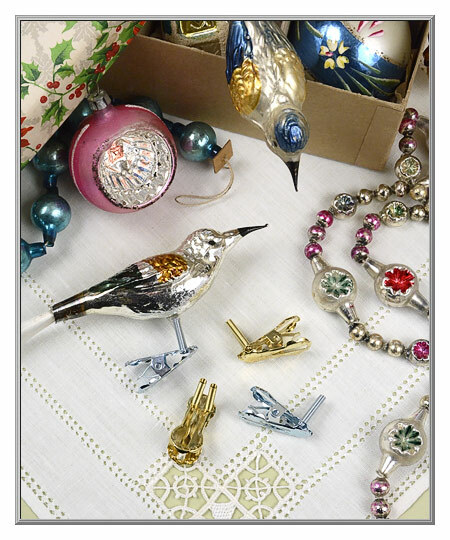 Our decorative bird leg clips are nifty for repairing vintage glass ornaments, and if you are a crafter, the clip-on fasteners are a stylish way to display your creations on a tree. 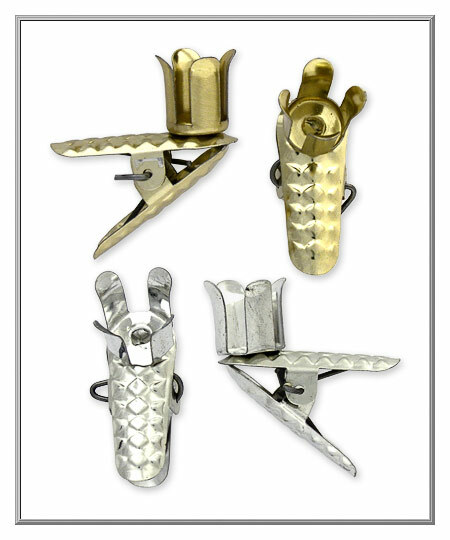 These lightweight tin clips feature pointy "teeth" on the front of the clip and a surprisingly strong grip that will really take hold of any Christmas tree branch. 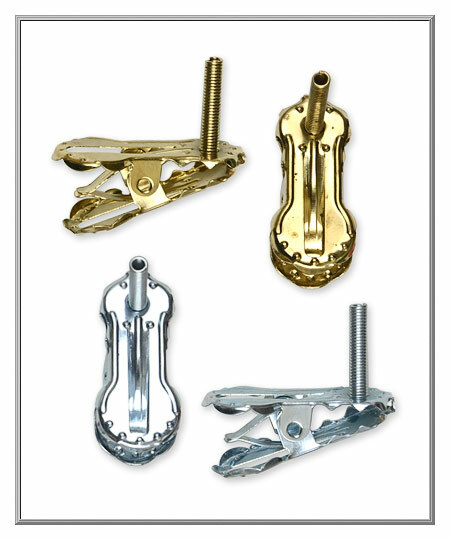 The shiny, embossed metal spring clips have a single leg of spiraled wire. Germany. Clips are 1-1/4" long by 1/2" wide. Leg is 5/8" high by 3/16" wide. 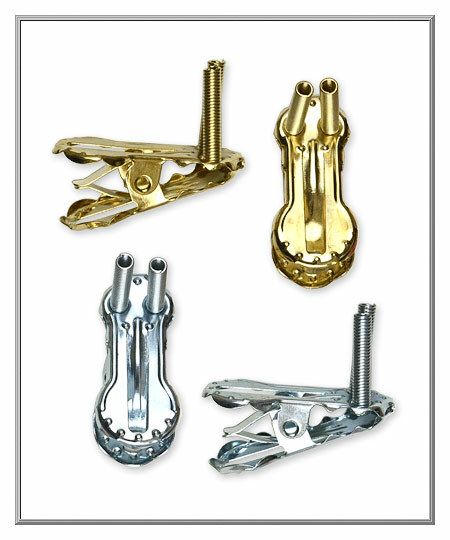 Set of 2 clips per color. 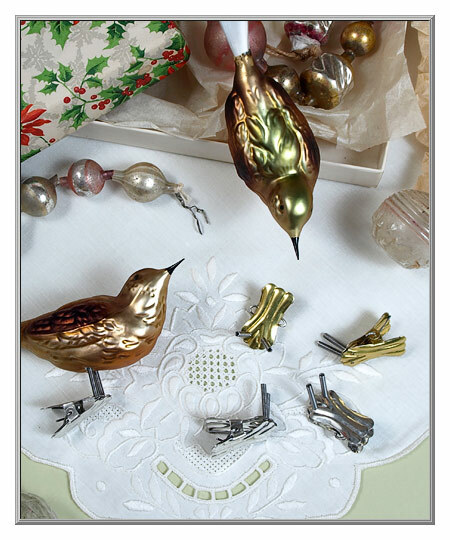 Made with a pair of legs, these bird leg clips can be used for the restoration of vintage blown glass ornaments, or use them to display your creations in a floral arrangement, on a wreath or tree. These lightweight tin clips feature pointy "teeth" on the front of the clip and a surprisingly strong grip that will really take hold of any Christmas tree branch. 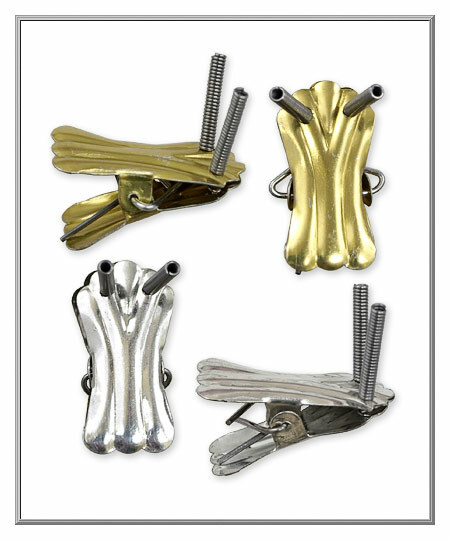 The shiny, embossed metal spring clips have two legs of spiraled wire. Germany. Legs are 5/8" high by 3/16" wide. 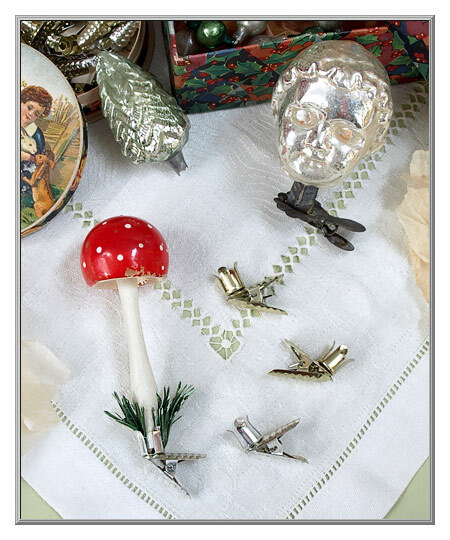 Authentic ornament supplies that we import from a family-run manufacturer in Germany, these '30s style tin clips have a fluted, embossed design. The spring clips have two spiraled wire legs. 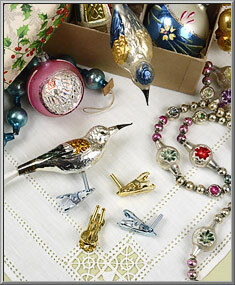 These classic pronged Christmas ornament clips are designed to hold glass ornaments safely on a tree branch. 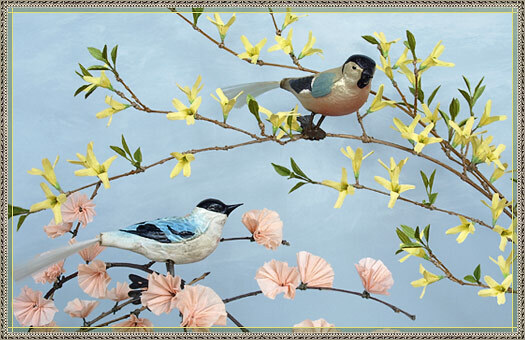 Made with a spring clamp, the four-pronged cup holder can be pinched in tighter to adjust the fit for a snug hold, but do note that you should add a dab of glue to secure the ornament. 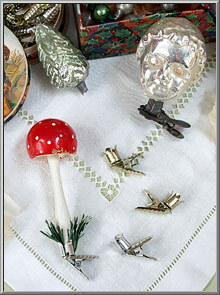 Embossed with a pine cone design, the shiny tin clips are made in Germany. Clips are 1-1/8" long by 3/8" wide. Cups are 1/2" high by 3/8" wide.